For home. For work. For homework. The American Heritage® Talking Dictionary™ is the first word in dictionaries. With over 200,000 definitions, 90,000 links to spoken words, an integrated thesaurus, brilliant multimedia, geographical and biographical entries, and more, you'll never be at a loss for words. And, with a variety of search features and instant access to definitions from any Windows program, you'll never need another dictionary! The first true simulation of sports-car racing for the PC features the Dodge® Viper, the hottest car on the road in North America today. Viper Racing combines the best of easy-to-master arcade racing with the challenge of a serious simulation in three different levels of realism. 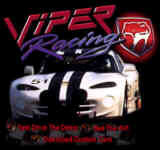 Both the street-legal stock Viper and the stripped-down-for-racing Viper GTS-R are modeled in complete detail. Drivers can utilize sophisticated racing telemetry analysis to tune their car using the same techniques as real-world racing teams. A unique career mode lets you earn money to upgrade your car and move up through three diffrerent classes of Viper racing league. Item: no. swah101 2 lb. Item: no. swce101 2 lb. Item: no. swtt101 2 lb. Item: no. swpremf101 2 lb.